“God is Bigger Than the Boogie Man” is one of my grandson’s favorite songs to sing. It’s a catchy little tune isn’t it? When we sing it over and over and over we laugh a hardy laugh. You try it, say it over and over and see how you feel afterwards. Wasn’t that fun? Doesn’t God have a great sense of humor? Talking Veggies! Veggie Tales is an American series of children’s animated films featuring anthropomorphic vegetables in stories conveying moral themes based on Christianity. They frequently retell Biblical stories, sometimes anachronistically reframe, and include humours references to pop culture in many different ears by putting Veggies spins on them. Big Idea has also published Veggie Tales books and music CDs and branded items such as toys, clothing, and garden seeds for vegetables and flowers. I for one love the name “Big Idea Productions.” for the name of the publishing company. That’s a God thing. Isn’t it? VeggieTales has a continuous back story that all the cartoons are actually teleplays, performed by various vegetables and fruit that live together on the same kitchen countertop. Some of these characters have “real names,” and take on various roles in the teleplays, although they will also often appear as themselves. Most of these “regulars” were established in the very earliest videos, while some have been added more recently. Don’t forget! 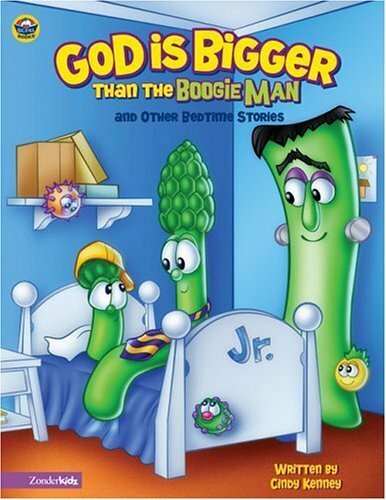 God Is Bigger Than The Boogie Man, God Is Bigger Than The Boogie Man. Did I tell you that God Is Bigger Than The Boogie Man? I don’t think that Veggie Tales is just for kids. It’s for parents and grandparents too. Remember God Is For You!